Home » American Politics » CHARLOTTESVILLE: The Danger of TRUMP’s Intervention. There are no many sides in this violence, there is only one side, the aggressors, and that side should rightly be named and condemn. The second paragraph of the United States DECLARATION OF INDEPENDENCE state as follows: We hold these truths to be self-evident, that all men are created equal, that they are endowed by their Creator with certain unalienable Rights that among these are Life, Liberty and the Pursuit of Happiness. The “Unite the Right” rally organised by Jason Kessler a prominent voice in the white nationalist movement, to protest Charlottesville’s decision to remove the statue of Robert E. Lee from the city’s Emancipation Park descended into violent clashes following a counter protest from the group of people attempting to defend their city. This is important for historical perspective, a general who advocate slavery and oppose equality, a position that directly counters the declaration of independence does not have a place in society, as such his statue in the emancipation park is an insult to the declaration, and an irony. An irony because the word “emancipation” means freedom, and as such the statue that symbolises slavery is to be rightly removed. The “Unite the right” a movement that includes members of white supremacist, white nationalist, alt-right, neo-Confederate, neo-Nazi, and militia movements demanding the renaming of the Emancipation park as Robert Lee Park and demonstrating the decision to remove his statue are by all means the aggressors, the counter protesters and the people of Charlottesville are simply defending their city from the aggressors. Michael D’Anonio echoed my sentiment and perhaps put it more succinctly. Jason Kessler frantic noise calling the counter protests anti-white violence and denial of their right to peaceful protest is a case of a perpetrator claiming victimhood. President Trump failure to condemn the fascist group specifically is a dangerous sign but not a surprising one. So, there is a history of hesitation to condemn these groups even as a candidate. Yes, Mr President, this is correct; Americans need to unite for the love of the nation, the trouble, however, is that such words are meant to be directed at the people fostering division and not the victims. Condemnation of violence on many sides or on all sides is a failure to grasp the main issue been advance by the “unite the right”, the group is advancing a case that opposes the declaration of independence that says all men are born equal, a document the president swore to defend. 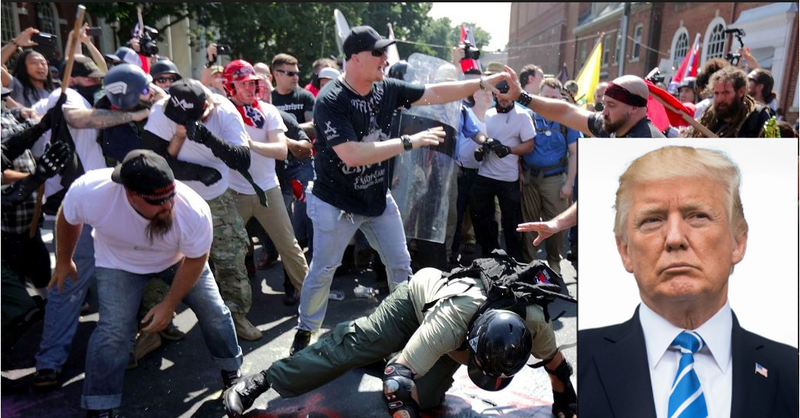 Condemnation of violence on many sides or on all sides is simply giving a tacit support for these fascist groups under the umbrella of “unite the right” and blaming the victims i.e. the people of Charlottesville for standing up against a dangerous ideology that have largely been driven under but suddenly found their voice during the Trump candidacy and presidency era. The death of Heather D Heyer and the injuries sustained by many has been condemned as “domestic terrorism” by many, including notable Republican Senators such as Ted Cruz, Marco Rubio and Cory Gardner and rightly so, however President Trump is yet to acknowledge the driving of a car into a crowd of counter protesters by James Fields as a terrorism offence. The frantic effort by the White House to explain what the President say or did not say underline the vagueness in his response, and this cannot give the people of Charlottesville and everyone who rightly uphold the sanctity of the idea of freedom and equality for all any confidence that Trump is a president for all Americans and not just some Americans that happens to be white. Trump’s candidacy and eventual presidency has emboldened and somewhat legitimise these types of attack by White supremacist groups on the fundamental basis of equality enshrined in the declaration of independence. The danger of the president’s intervention in this particular instance by condemning violence on “all sides” instead of calling out the real perpetrators of violence is that these types of activities may now become frequent, bolder, louder and even more dangerous and will further divide an already divided nation. 2 Comments on CHARLOTTESVILLE: The Danger of TRUMP’s Intervention. Hello stolenhunder07, thanks for your response. The trouble is my article did not address right or left, republican or democrats, who won or lost an election etc. My article address History. What Hilary did, Obama did are different topics i may have addressed in another fora. However, which fact of history in here did you disagree with?